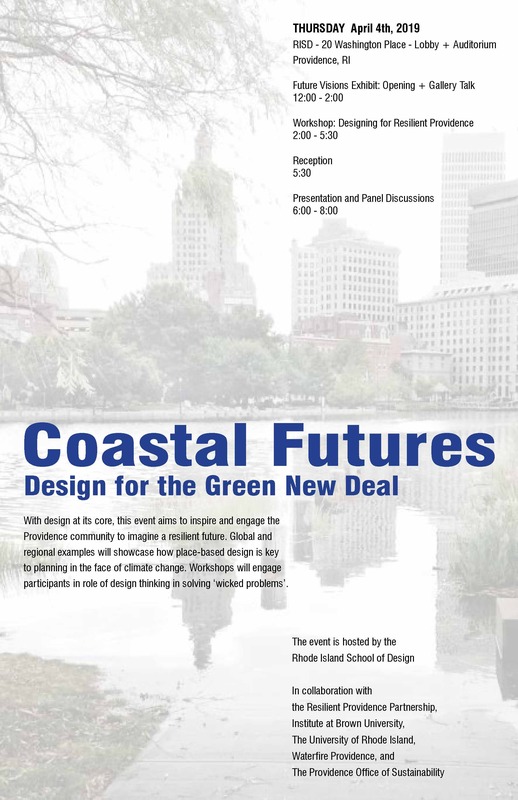 As part of an all-day symposium surrounding the opening of a new exhibition on climate change, resilience, and coastal adaptation at Rhode Island School of Design (RISD), Utile’s Director of Sustainable Design, Jeff Geisinger, AIA, LEED AP, CPHC® will participate in a panel discussion with Hillary Brown, FAIA, Director of M.S. Program in Sustainability in the Urban Environment at the Spitzer School of Architecture, and Alan Plattus, Director of Yale University’s Ph.D. program and the Yale Urban Design Workshop and Center for Urban Design Research. Presentations and panel will be the culminating event in the day’s program, which will feature a gallery talk, exhibition opening, and workshop, “Designing a Resilient Providence”. In addition to his work at Utile, Jeff teaches Environmental Design I & II at RISD, guiding the next generation of designers in how to create a more resilient, sustainable, and socially equitable built environment.